Photograph, black and white, Pendragon Castle, Mallerstang, Westmorland, by Herbert Bell, photographer, Ambleside, Westmorland, 1890s. Photograph, Pendragon Castle, Mallerstang, Westmorland, by Herbert Bell, photographer, Ambleside, Westmorland, 1894. Vol.1 no.31 in an album, Examples of Early Domestic and Military Architecture in Westmorland, assembled 1910. 31. Pendragon Castle. Kirkby Stephen. E.
Photograph, Pendragon Castle, Mallerstang, Westmorland, by Herbert Bell, photographer, Ambleside, Westmorland, 1897. Vol.1 no.32 in an album, Examples of Early Domestic and Military Architecture in Westmorland, assembled 1910. 32. Pendragon Castle. Kirkby Stephen. E.
"This Pendragon castle was repaired by the lady Anne Clifford, countesse dowager of Pembroke, Dorsett, and Montgomerie, baronesse Clifford, Westmerland, and Vescie, high sheriffesse by inheritance of the county of Westmerland, and lady of the honour of Skepton in Craven in the year 1660; so as she came to lye in it herself for a little while in October 1661, after it had layen ruinus without timber or any covering, ever since the year 1541. Isiah, chap.lviii. ver.12." Pendragon Castle, twelve Miles from Appleby, the Seat of the Earl of Thanet, Hereditary Sheriff of the County. This lady [Lady Anne Clifford] was one of the family of Clifford; she had no less than four castles in this county, of which Pendragon Castle was the chief, which is a fine building to this day. Circle, tower with a flag. Book, A Tour from Downing to Alston Moor, 1773, by Thomas Pennant, published by Edward Harding, 98 Pall Mall, London, 1801. Print, engraving, Pendragon Castle, Mallerstang, Westmorland, drawn by Moses Griffith, engraved by S Sparrow, published by Edward Harding, 98 Pall Mall, London, 1801. Tipped in opposite p.131 of A Tour from Downing to Alston Moor, 1773, by Thomas Pennant. Moses Griffith. Del / S Sparrow. Sc / PENDRAGON CASTLE / Pub June 1 1801 by Edw Harding 98 Pall Mall. Guide book, Kirkby Stephen, written by J W Braithwaite and published by J W Braithwaite and Sons, Kirkby Stephen, Westmorland, 4th edn 1922. Print, halftone photograph, Pendragon Castle, Mallerstang, Westmorland, published by J W Braithwaite and Sons, Kirkby Stephen, Westmorland, 1922. Tipped in opposite p.16 of a guide book, Kirkby Stephen, 4th edn 1922. 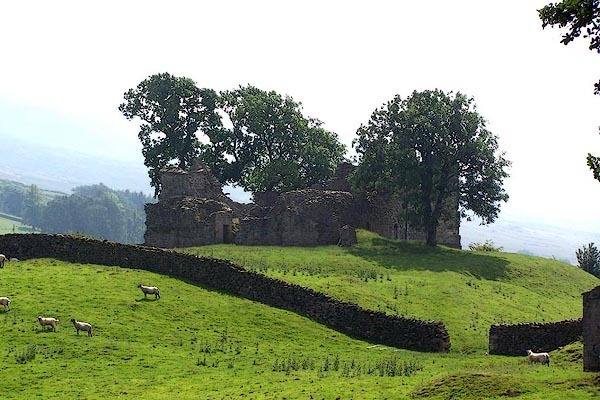 PENDRAGON CASTLE, 3 MILES FROM KIRKBY STEPHEN. Fortified tower-house dating from C12 with later additions and alterations; extensively restored 1660 for Lady Anne Clifford. Dismantled c1685. See descrip- tion and plan in R.C.H.M. pp 163-164; since its publication some of the fallen masonry has been cleared away, uncovering north entrance with spiral stair to either side of passage which was closed by portcullis (slot visible in masonry). Scheduled Ancient Monument. hearsay The castle is said to have been built by Sir Hugh de Morville in the time of Henry II. Sir Hugh was one of the four murderers of Thomas a Becket, 1170, though tradition says he only held back the crowd at sword point while the cleric was killed. After the murder he was exiled to France. Ownership of the castle eventually went to a nephew. came to lie in it herselfe for a little while in October 1661, after it had layen ruinous without timber or any covering since the year 1541.
hearsay It is said that Uther Pendragon lived here, the father of King Arthur. He built the original castle on an existing mound, roman of course, in the late 5th century. Uther was a giant warrior, and a canibal, and fought the Saxons from Dumfries to Cornwall. Merlin, the magician, is supposed to have helped Uther take the form of King Gorlois so tha he could sleep with the queen, Igerna, at Tintagel Castle. Thus was Arthur conceived. Uther tried to divert the River Eden to flow around the maot at Pendragon castle, and failed. Awkward stuff, water. The moat is dry. The Saxons could not defeat Uther on the battlefield, but in a siege they poisonned the water supply. 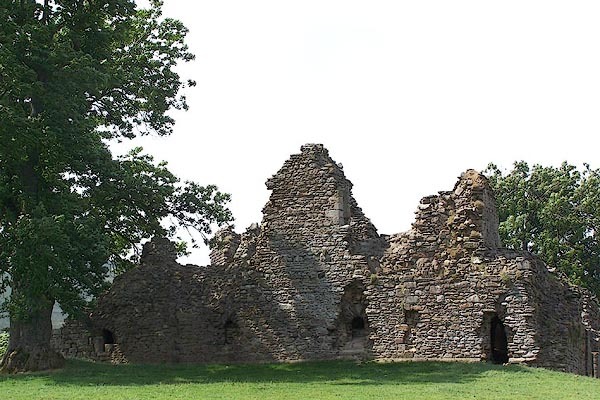 In 515 Uther and a hundred supporters died from the poisonned water from the castle well. Then tere was anarchy, till Arthur grew old enough to create a kiingdom.